Vintage Leaf Memories - Michael Langlois: Maple Leafs head into a long Christmas break with a win in Dallas….. Maple Leafs head into a long Christmas break with a win in Dallas….. I have, however, enjoyed a number of story lines this season from other markets, including: what we’re seeing out of Long Island; the Panthers' rebound from a poor 2013-’14 season; the job Ted Nolan is doing with a sometimes over-achieving roster in Buffalo as well as the rather remarkable turnaround by Columbus over the past few weeks. Marcus has mentioned the possibility of a discussion relating to Kadri. The young Leaf center’s star has shone fairly brightly for the most part this season, though he seems to be one of those lightning rod figures in Leafland. Is he a keeper? Will he be worth the big money he will demand on his next contract? Is he a guy we need to rely on to help get us over the top? Pep has raised the question (via Twitter): if you were Nonis, what one or two moves would you make with this roster? Russ has asked: what would be a great Christmas gift for the Leaf organization, in terms of management or roster considerations? Also, I was flipping the radio dial the other day and heard (briefly, before tuning out) a conversation about the wisdom of “benching” Phaneuf. It’s not something that had even crossed my mind, but, well, it may be something Leaf supporters have considered. Mostly, with Christmas here, I want to thank those VLMers who have stayed with the site over the years. I appreciate your contributions immensely, and hope VLM continues to provide fodder for thought as well as friendly debate and discussion. P.S.- I’ve written about one-time Leaf Noel Price (above, right) at this time of year in the past. Because of his name, Price always comes to mind at Christmas time. He was one of those Leafs who was part of my very early youth as a Leaf fan. Here is a link to one of those posts. At this time of year, even more so than at other times. I try to take a moment and reflect upon those things that I am grateful for. Among others, I am thankful for VLM, the commenters, and especially you. Thank you so much for continuing to put the effort into this wonderful site, my appreciation I hope, is evident in my many comments. I will make an attempt today, at brevity. Should they trade Gardiner, yes, the same as any other player. They should endeavour to replace him, if they value what they are receiving more than what they already have. He has struggled, and he continues to struggle playing in his own zone. This is not something that is unique to Jake. The entire team struggles inside the blue line. Our coaches reputation is defence first. I tend to give more credit to Niedermeyer and Pronger for that reputation but, I digress. My gift to the Leafs would be clarity. The ability to see players for who they truly are, instead of through the Maple Leafs coloured glasses. I could also call them the Mimico glasses, both sound great to my ear. Every time I think the team is making progress in this regard, I see David Clarkson on the powerplay. He is not one of our top 6 forwards, and we need to stop falling into the same old patterns. Kadri is always going to be a hot button. Personally, I find him off putting. I think he will always be a tweener kind of player. Not really good enough to be among the best, but he will always put up numbers due to his talent. I see him with a Mike Ribeiro career path. Considering the teams ability to draft and develop getting that kind of production and longevity, would be marvellous. I too, heard the bench Phaneuf and Kessel talk. They were on and on about it. For me, it comes down to accountability in the locker room. The feeling is that none of the best on the team is held accountable when they aren't playing hard enough. The team is imperfect, probably always will be. Is benching Kessel the wrong thing to do? No, but it also isn't likely to make him play harder defensively either. The problem isn't Kessel, the problem is other players on his line emulate his effort level, thinking they can glide on the backcheck too. I'm looking at you Bozak. In all honesty, I don't want Nonis doing anything with this roster. I would be much more comfortable with Shanahan making the moves behind the curtain. I would like to wish everyone here at VLM, a very Merry Christmas, as well as, a safe and happy holiday season. Accountability is the one issue, that, as you cite, will potentially hold this team back, Jim. Everyone on every team talks about it and says things (after poor games) like it's "not acceptable". But it's often all just talk. The great teams are determined most of the time- they don't have to go on about it, they just play that way. Thanks for your kind comments, by the way. I think you know how much I value your contributions, and the comments from other posters demonstrate the same feeling about your input here. Merry Christmas to you and yours, Jim. The Leafs are pretty much where I thought they would be, 6th. They just aren't doing it the way I thought. Kessel and JVR haven't been dominating as I imagined, Bozak has been better than I guessed, but top line as a whole has been down a notch. Yes, he is rounding into an elite second line center. He is developing his defensive game. How many better 2nd line centers are there in the league? Some nights he looks like the Leafs number one center. "if you were Nonis, what one or two moves would you make with this roster?" A better 4th line center? Trevor Smith isn't quite to the level of the rest of the roster. He seems like the weakest link. Booth and Panik are way above average for a 4th line. Smith should have more than 2 points in 20 games with those guys. If they could get a veteran guy, who is good defensively and a faceoff ace, that would be great for late in the game or the playoffs and the Leafs 4th line would be better than some 3rd lines. Pending UFA's at the end the season might fit: Antoine Vermette, Daniel Briere, Torrey Mitchell? "what would be a great Christmas gift for the Leaf organization, in terms of management or roster considerations?" People are impulsive and don't remember the last time he was injured. Thanks DP- hopefully Komarov is back soon! We seem to have waited almost as long as possible to make a decision on Kadri and that may have cost us, but I think we are finally seeing that he may be willing to buy in to a more rounded game which could justify a fairly significant contract. Is he a Taylor Hall - Six Million Dollar Man? Well he may match up to that player, but I don't think Hall was worth 6M, so I'd hope we can sign him for less than that. Hard to say what will happen since he already did an interim bridge contract. If he doesn't fit into our salary structure, I'm sure he would command a good return, but I'm inclined to keep him now that he's playing a 200 foot game. Pep's query on Nonis roster moves: I'd look at obtaining Clb Ryan Johanson and taking on the expense of that Horton LTIR contract... that would be a trading chip that could land the big center! I would offer up Kessel and Bozak (who may waive any no trade implications in order to remain a comfortable pairing) and hope to pick up a good draft pick as well. The same idea could be used with other LTIR packages - like Mattias Ohlund in TB to facilitate Stamkos :). Russ: I want Leo under the Leaf Christmas tree, ready to join us after Boxing Day! Radio Coaches benching Phaneuf: Sure they can have fun with that on NHL15, but he would be too noticeably absent in the real world. Yes, he makes more mistakes than a true elite defenseman and we'd like him more at a lower pay grade, but we need him (or a good replacement). So, benching him would add no value whatsoever! 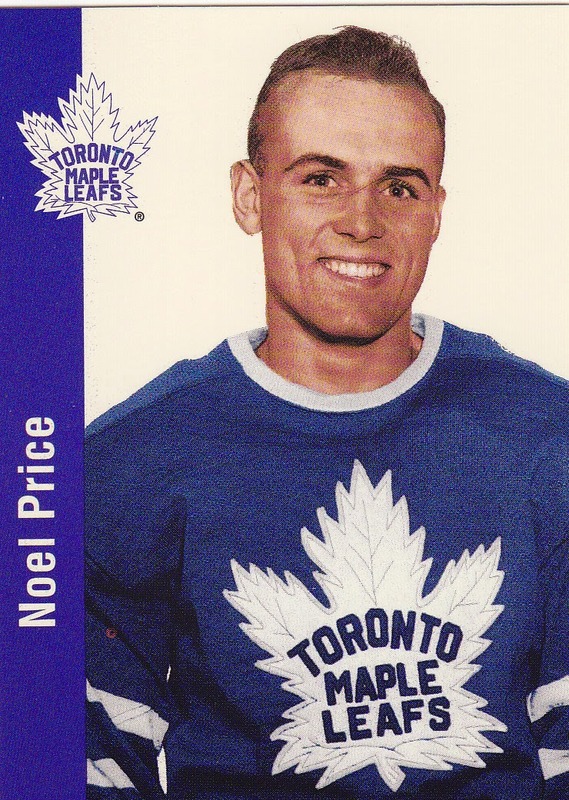 That must be the same Noel Price who played for the Atlanta Flames... pretty sure I have that hockey card somewhere (though I didn't realize he had been a Leaf)! Have a blessed Christmas with your family, Michael. Hi Michael. Our power went out for a moment, there's quite a wind storm tonight, (crossing my fingers here!) so a quick post. I just wanted to thank you for this wonderful and unique site and wish you and fellow posters a wonderful Christmas. Merry Christmas, Colleen! And thank you for your much appreciated contributions here. I am very glad I found VLM this past May! It is great fun to read your posts and to discuss them with you and my fellow VLM readers. There is one topic you did not mention, some time ago someone (I don't remember exactly who it was) suggested to talk about the influence the press has on the leafs, I added somthin to that, and I would really like to talk to you about that. I hope you have not scratched it from your shortlist. This year is about the evaluation process, so I would make no big moves at that point. For Shanahan it is about to find out where we are and what we need. But we have needs at center and on D and if some trade presents itself I would not mind. A potion that gives every Leaf a work ethic and makes him show up every night. And for management something that helps them make the right decissions for our future. Clarity as Jim said. I would like to know where you heard that. My boys at Leafs lunch talk about it now and then. But I haveb't listened to them as much the last few days. Doug Gilmour told a Story about Pat Burns who had benched him after a giveaway at the beginning of the game. And I agree ice time is the only real "weapon" a coach has. But you can not tell from the distance if these psychological moves will help. Will they reach the player? Will they get the opposit result? Comes it natural for a coach to do that (will the players belive that move)? Is it to late to start something like that for Carlyle? When it is about sitting Phaneuf in the press box, that would be a very bad move and I wouldn't do it at all. He is not worth the big money he will demand. He won't put us over the top. There are real problems with Kadri's character. Shanahan and his staff have to come up with a plan for the future, what they intend to do. We face cap space trouble as I said before and we have signed a lot of mediocrity to long term contracts. We have to face that we need some change and that we need room for that change, in cap space and in roster spots. Eating up our cap space by signing Bernier and Kadri and Franson to big money contracts would only add to our problems and would not leave any room for improvement. Management has to make smart decissions and smart moves to get us on track for the future. I hear you on your other points- that this is very much an evaluation season (though I also felt that way during Carlyle's first season -the lockout year- behind the bench; the importance of the team's work ethic; and concerns around benching top players. The Kadri debate will continue in Leafland for some time, I sense. And yes, Shanahan has some decisions to make, contract and cap wise. Most importantly, Merry Christmas, Marcus. I'm glad you found VLM! I completeley agree it needs it's own column. Only adding a few words would not be enough. I have no issues with benching player's, let's asume it is Pat Burns who comes in new and says: okay guys, there will be some areas where you will be allowed a lot of freedom, but if you do this and this and that you will sit, no matter who you are and what your contract is. I think that's okay but it is also okay if it is not in Carlyles book, he is the coach. But something gets on my nervs with these guys in these shows, if it is about money and contracts they are all business, and they stand up for players who turned their backs on their old teams for money and that is okay and that's business. But if it is business in another way they pretend to be naiv. Nobody knows what Carlyle's orders are. What he is allowed to do and what not. What is on his list he has from MLSE, Nonis or who ever. Nobody knows. And on these shows often are a radio guy and two or more experts, ex players, GM's, coaches what ever and they all know the mechanics of the business. I am not only talking about this topic but there are many other things where this applies. My post included three specific questions plus supporting comments from Marcus, Colleen & Pep. Hopefully, it can assist you in preparing your post. Note: While I don't have the answer, I suspect your techy might be able to come up with a way that you can search your database including comments for specific subjects, key words, VLMer posts rather than having to totally rely on memory. Perhaps your followers could also access? Happy Boxing Day - used to be my favorite day of Xmas season. USA have ruined as it is second busiest shopping day after Black Friday over Thanksgiving - CHAOS. Hopefully, Canada hasn't copied this practice. Thanks for jogging my sometimes fading memory, Ralph (RLMcC)- there must be a way to search this stuff rather than rely on my memory! I will aim to post in the new year on that subject. Happy Boxing Day to you as well- I think it's a bit crazy here as well, in terms of shopping! Lots of food for thought here! Kadri does seem to be taking a step this year, harder on the puck, falling down less, and showing up in his own end most nights. I'm terrified to see what he and his agent toss out there as an introductory contract offer though, as Naz is a confident young guy, and you can bet he'll be shooting for the moon. The one ace-up-the-sleeve the Leafs may possess is that Kadri absolutely loves the spotlight of Toronto, racing towards any microphone in earshot. He may not want to trade that for the relative obscurity that a non-Ontario market might offer a home bred boy. Pep's question about roster moves is a hard one, based on that pesky salary cap. I don't see this roster offering the potential of any sort of juicy blockbuster trade, so I think it will end up more or less like last year, with incremental change to the lower lines and D-men. That's not to make light of last year's off season moves, as they brought in a mature presence and work ethic, just not enough to move the needle in any sort of tangible way. As far as my own question, my "Christmas wish" probably isn't out there for this squad, and that's a rock solid leader, the sort of captain that motivates his squad with a mix of work ethic and skill... the sort of player that can legitimately hold the room accountable, beyond whatever the coaching staff happens to be chirping. Not trying to knock Dion here, but I'm talking of players of the Toews, Getzlaf, Chara, or Stamkos. Like I said, it's a "wish list", not routed in reality. I've always felt that having a leader that exists in that pantheon provides a trickle down effect that bleeds a little bit through the entire roster. Not many past Leafs pointed at captains Dougie or Wendel after a game, and griped that their captain didn't give his all. The benching Phaneuf idea probably isn't a good one, as it sends mixed messages to the team. On one hand, management has anointed him as the team leader in hockey's biggest market, yet on the other you'd be implying that there are nights that Dion doesn't even deserve a roster spot. If you feel the need to bench your captain, maybe you've got the wrong captain. I loved the stories you were following this year Michael, and I would add Calgary to your list of Columbus, NYI, Florida and Buffalo, beaten and left for dead by some, but pushing to be competitive. I love underdogs, and think what Ted Nolan is doing is nothing short of amazing. A crappy record? Sure, but Nolan seemed to get his back up as the media bestowed the McDavid #1 draft pick crown on Buffalo before a puck even dropped. That's real hockey, ignoring any pipe dreams management may have about the #1 pick, and pushing your squad to play with dignity. The Oilers could learn a valuable lesson here. If Edmonton continues to play indifferent hockey, McDavid (or another elite young man) will be walking into a terribly toxic environment, with the weight of the world on his shoulders to turn things around. He'll be surrounded by disgruntled, give-up-easy team mates, and it's not fair to expect an 18 year old to turn that ship around. That's "ship", not "18 wheeler"! Good points about the Flames, Russ. They belong on any list of the good stories this season. Kadri will want a huge contract. That will be a big decision for management. I think most Leaf fans appreciate what Dion brings, but leadership always seems to be an issue here. Clark/Gilmour types are hard to come by, for sure. I can see benching Phauneuf (or anybody else for that matter) for part of a period or a whole period. Let him sit on the bench and stew in his own juices for a bit. He strikes me as the type to come out totally ticked off and he seems to play better with a burr under his saddle. I don't see sitting him in the press box doing anything other than embarrassing him which is going too far. Carlyle talks a good game about accountability but I don't see him holding everyone to it. He has his favourites that can do no wrong and they get away with most anything they want. The story holds he was the same in Anaheim so I don't see him changing. Just another strike against him as a coach in my opinion. These are kind of shoot for the moon deals that certainly are not simple deals to make. With the cap and NTC's the day of the blockbuster trade is most likely behind us unless all the planets line up. Having said that, I would shoot for 2 possibilities. The first one requires a GM that isn't exactly known to make every deal a solid one. So let's pick on Mr. Snow on the Island. If he can trade a first round pick for Vanek that turned into an expensive rental and then flip him at the trade deadline for spare parts we might have found our man. Offer him Kessel for Tavares straight up. Doubt he goes for it even then so sweeten the pot with Gardiner and/or a prospect. There isn't a stanley cup winner that I can think of that was built around a winger. They were all built around the center of the ice and then filled in from there. Tavares would be far and away our best center since Sundin and could be better than that even. And once Kessel starts to lose a step in a few years I just don't see him being the same player he is now. Tough sell but worth a shot. The second one is the Oilers. Sooner or later they are going to have to quit over valuing their players and make a deal or there will be a riot instead of just a mutiny from their fans. They need dmen and a goalie bad. How about Reimer, Gardiner, Clarkson (they almost signed him originally), for Eberle, Scrivens and Marancin. Benny is not a #1 goalie but he can be one of the best #2's in the league and a solid backup for Bernier that can play 30 games a year. Eberle gives us an upgrade on Clarkson by a country mile in skill and would fit in as a perfect 2nd line right winger sniper. Marancin is a young dman who has lots of potential in the Polak mold of player. His development has been held back by the Oilers like most of their players so could be one of those quiet throw in the trade types that looks good in a couple years. Neither trade should be an issue for cap from both teams perspective. The hold up could be NTC's though. You got me thinking with some of those trade possibilities, Pep. Not sure if the Leafs could make that happen when it comes to Tavares (don't think the Isles want to let him go), but the Oiler deal is intriguing. Tavares is such a high end talent that I agree with Michael, Pep, but there's nothing wrong with getting on the phone and figuring out the asking price. Your Edmonton idea is intriguing, as the Oilers' phone must be ringing off the hook with potential deals. I think that Reimer and Clarkson could be a great (and needed) part of a package to Edmonton, but I'm not sure if Gardiner would be in that mix. That team is so small and easy on the puck as it stands, so I think the Oilers would prefer a more bruising, stay at home presence on the blue line. Those NTCs have definitely taken the fun out of trade deadline day, as you mentioned, as so many players have their destination guaranteed, and it's so hard to move meaningful pieces. I hope the Leafs learned their lesson, when they had that "war" with the "Muskoka 5" (as Bill Waters named them), with a core of veteran players they wanted to move, but were essentially stuck with. So my thoughts above on benching Phaneuf for a period or part one. Part way through the 2nd period in Florida would be a good time to try it I think :) He couldn't play any worse in this game if he tried to.